The Advertiser newspaper has an article 10 Sept 1883 about this suburb of Adelaide. Malvern was created out of Section 242 of the Adelaide hundreds, originally owned by Trimmer and Granger. There was a Malvern Grammar school 1899-1901 that became Ladies Methodist College and now is known as Annesley College. A Malvern post office was opened in 1949. Malvern was home to a Uniting Church and a Methodist Church. The town of Malvern is reported in the SA Gazette & Mining Journal on 27/1/1849 but land did not go on sale until 1882. The division of the town into individual lots that sold to the general public as the Malvern Estate occurred in 1883. Housing dates primarily to the 1880s & 1890s. "Only a few years ago the Great Malvern Estate of to-day was a waving wheatfield. Now it is improved by the settlement of a large population, living in superior villas of the most modern type and newest designs. Water, gas, postal deliveries twice daily, macadamized streets, tram communication, &c., and all the advantages of city life are obtainable in this suburban town of Malvern. Besides educational facilities, the Town Hall, Institute, Post Office, Telegraph Office, Stores, and Churches of several denominations are in the immediate vicinity, and the beautiful new Wesleyan Church in the centre of Malvern Estate is quite an ornament to the town. The soil is most excellent in quality, as indicated by fragrant flower and fruit gardens, and with tall trees intervening the Estate presents one of the most attractive and charming spots suburban to Adelaide. MALVERN ESTATE is higher than North or South Adelaide, as shown by the Hydraulic Engineer's levels thus: - North Adelaide highest point above sea level: 170 feet, South Adelaide highest point above sea level: 175 feet, South-west corner Malvern Estate above sea level: 200 feet, South-east corner Malvern Estate above sea level: 223 feet. The Estate is near the spacious Oval on New Parkside, and the splendid Reserve bids fair to become a popular resort for sports and pastimes. Trams run between Adelaide and Malvern Estate 90 times daily; fare only 2 1/2d. A double line will shortly be laid down as announced by the Company. On completion, cars will be running morning and evening every 10 minutes. For allotments in various positions, and eligible corner blocks and business sites, apply to C.H. MATTERS & Co., Estate Managers, Financiers, &c., Opposite Town Hall, Adelaide." Hope you will visit us when you are in South Australia. We are open Mon, Tues, and Wed 10am-4pm and Sunday 1.30-4.30pm. 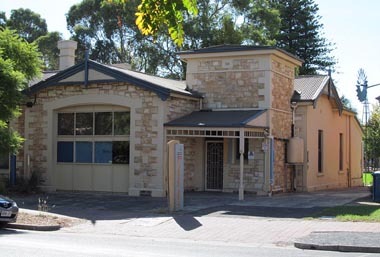 We are located at 80 Edmund Avenue, Unley (1/2 a block from Unley Road).